Sub-titled "A Reconnaissance Into the Mysteries of John F. Kennedy's Signature"
This out-of-print book (published by Hamilton, New York, 1965) is indispensable for sorting out the various robot and secretarial signatures used by JFK. 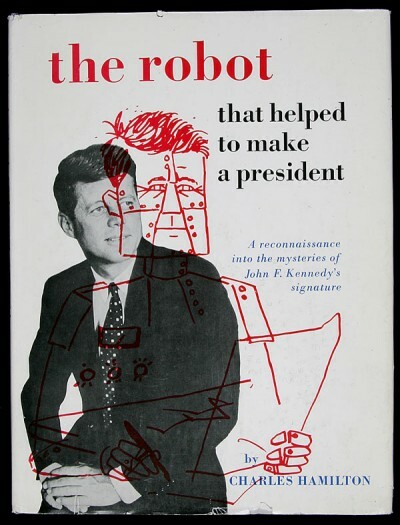 The Robot That Helped to Make a President, by the esteemed Charles Hamilton-arguably the father of modern philography-is the definitive study of John F. Kennedy's signature. This book is an absolute necessity for anyone who wants to purchase or authenticate the most mysterious signature of the 20th Century. Only 1,000 copies were issued 45 years ago and those quickly sold out. Today, a copy of this landmark reference work is virtually unobtainable. This copy is in very good condition—nearly fine condition on all interior pages—unsigned, but accompanied by the original sales receipt from Hamilton Autographs in 1965 (for just $7.50!). Featuring exemplars of Kennedy's own authentic handwriting, as well as the work of 8 Autopens & 14 Secretaries signing JFK's name on letters, photographs and documents spanning his Congressional and Presidential years, it is not surprising that collectors spend thousands of dollars each year on inauthentic memorabilia. With genuine simple cut signatures costing $1,000, and letters and photographs ranging up to $10,000, this book will more than pay for itself on your next Kennedy purchase. Among Mr. Hamilton's 16 other published books, before his death in 1996, were Collecting Autographs and Manuscripts (1962), Great Forgers and Famous Fakes (1980), American Autographs (1983) andThe Hitler Diaries: Fakes That Fooled the World (1994).